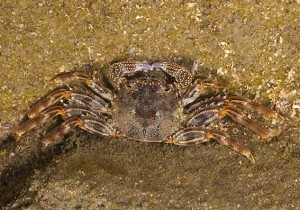 Short hairs cover body and legs; legs have sharp spines along top edge; front of carapace between eyes deeply cleft. To 70 mm across. Common at particular places, in crevices and pools on exposed rocky shores and rock platforms (especially Kings Headland, Caloundra). Eastern Qld; also subtropical and tropical western and eastern Pacific (north to Japan and south-east to Easter Island).